Book Drunk: Reviewed: A Robot In The Garden by Deborah Install. 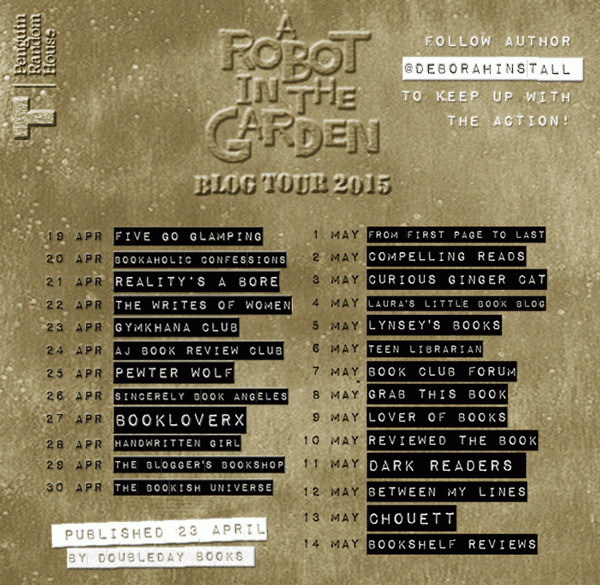 Reviewed: A Robot In The Garden by Deborah Install. 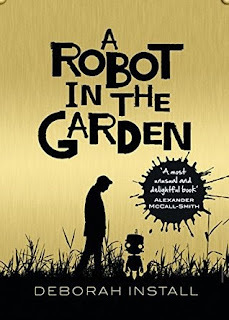 A Robot in the Garden was published by Doubleday Books on April 23, 2015. Thank you to Ben Willis for sending me a copy of this book to review for the blog tour. “I think I’m in love with a robot” are words I can’t say I ever expected to be uttering but how can you read A Robot in the Garden and not feel the same?! This book is one of the craziest, sweetest, most charming and entertaining books I’ve ever read and I loved every second of it. I can honestly say I’ve not read anything like this before. 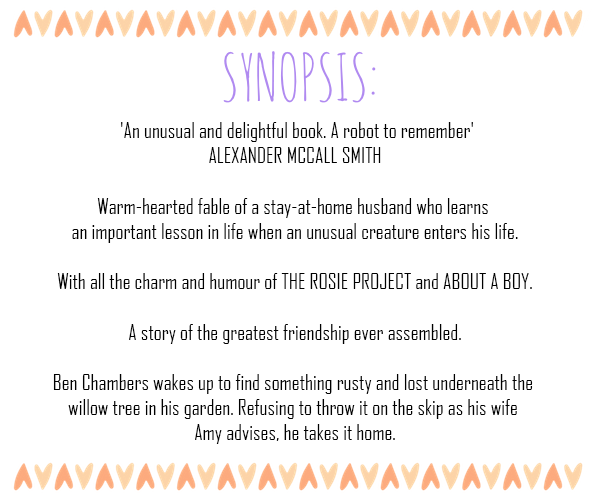 It’s sci-fi in the loosest sense, set in an age where it is not that surprising to come across a robot or an android, but a random broken robot turning up in Ben and Amy’s garden is not something they were expecting. Amy and Ben are experiencing some issues in their relationship and for Amy, a rusty old broken robot who isn’t of similar use to a high-spec android is not the solution. She’s mortified when Ben can’t bring himself to get rid of Tang. Ben is quite well-off and so chooses to live in blissful unemployment, not doing much with his life at all and not really putting in any effort to make their relationship work. As far as Amy is concerned, Tang is the final straw in their relationship and she walks out. Far from Ben to sit and mope and let the robot suffer, he instead chooses to get Tang fixed, cue the funniest, sweetest and most touching road trip across the world. Tang was adorable. I can’t even explain it. Deborah wrote his character beautifully. He’s very childlike in his approach to the world. He’s curious and inquisitive, asking question after question to get a better understanding of this strange world he’s living in. The way Tang spoke, Tanglish as he eloquently put it, really made me smile with his unintentionally funny way of wording things and ahh he was just too cute! He was stubborn in his refusal to help Ben learn about where he came from, or what he was doing in Ben’s garden, and if he wasn’t getting his own way, he would sulk in a manner that had Ben wrapped around his figurative fingers. That robot knew how to get what he wanted. More than anything, though, he was the most lovable best friend Ben could possibly imagine. Their road trip brought so many laughs but it was also very touching. With Tang’s friendship, Ben began to see what was really important in life and he appeared to become a better person right in front of our eyes. I was intrigued to find out what Ben actually wanted from life, because at the beginning of the book I wasn’t so sure. Cute, charming, funny, memorable and one of the most enjoyable books I've ever read. Just about all you need to do is actually kind the message in your mobile phone and deliver exactly the same towards the UNITED KINGDOM bankers.